With the change of seasons, you're likely to see a change in your hair and skin. One of the most common hair concerns that we receive questions about is dandruff. Dandruff can be very annoying and sometimes embarrassing, but if you learn how to treat it, you can be flake- and worry-free! A flaky scalp isn't necessarily dandruff. Several scalp conditions like eczema or psoriasis can give the appearance of dandruff. If you're suffering from severe, scaly plaque-like flaking, or see some of these patches on other areas of your body, you may want to consult a dermatologist for proper diagnosis. It's a common misconception that dandruff is caused by a dry scalp. While it can be, dandruff appears most frequently with an oily, irritated scalp. Due to the changes in weather, you could experience either. Luckily, there are several treatments that address both issues and help to prevent future dandruff. Since dandruff occurs on the scalp, it only makes sense to use a scalp treatment. No matter the cause of your flakiness, or even if you just want to promote a healthy scalp, you can benefit from Phytopolleine Scalp Stimulant Elixir. It's potent botanicals will purify and balance your scalp. It can be used prior to shampooing or as an intense overnight treatment. The next step is cleansing. When choosing an anti-dandruff shampoo, look for one with Salicylic Acid. This ingredient exfoliates the scalp, removing built-up dead skin cells or flakes. Popular shampoos include Glytone by Ducray Kertyol P.S.O. Scaly Scalp Shampoo, which also calms redness and itching, and Phytheol Intense Anti-Dandruff Shampoo, a botanical shampoo with clinical studies of 100% effectiveness. To effectively treat your dandruff, follow your product instructions precisely. Since you are essentially treating a condition, you'll need to lather, rinse and repeat. The first washing preps your scalp for treatment, while the second wash gets left on 2-4 minutes to do its magic. Different formulas will provide different instructions on the frequency of use, but be sure to follow these guidelines as well for optimum results. Are your styling products flaking off in your hair? If so, your solution could be as simple as finding a new styling product. Are you washing your hair enough... or too much? If you aren't washing enough - oil, dirt, styling products and skin cells can build up, causing dandruff. If you wash too much - you can strip your hair of its natural oils, actually causing your scalp to create more oil. 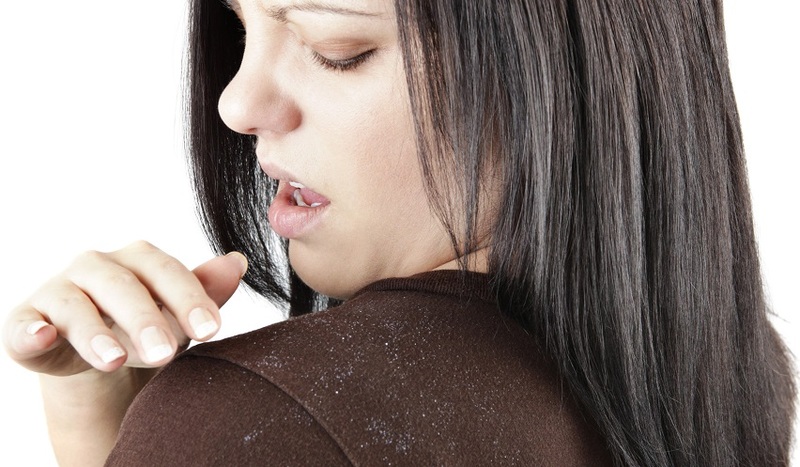 If built up, this excess oil production can cause dandruff. Is your water too hot? We all know a hot shower can be very relaxing, but if it's too hot, you can damage your scalp or dry it out, causing dandruff. See more tips and information in Beauty 101: Dandruff: Causes and Treatments. What hair concerns do you encounter in the fall and winter? Let us know how we can help!